On an anonymous poster distributed during the “Velvet Revolution” of 1989, there were two numbers: 89 and 68. These two numbers symbolized the two main popular uprisings in Czechoslovakia as well as two promises of alternative forms of socialism. The poster was designed to be read from two different perspectives; a bold-printed number 89 could be turned over and read as 68, as if autumn 89 were a mere inversion of spring 68. 1989 promised to be a new, more successful 1968. 1968 was distinctive for its transnational nature, as uprisings spread through such places as Mexico, the United States, China, Brazil, and Senegal. In Europe, 1968’s most striking and symbolically intense moments were France’s “Mai 68” and Czechoslovakia’s “Prague Spring.” Each of these moments was marked by its own kind of hopes and its own attitude toward state power: on the one side (in France), a clear opposition to state power, and on the other (in Czechoslovakia), an effort to create a new coalition between state power and the people. The “events of 1968” became a paradigmatic moment for an entire generation of philosophers. Philosophy reflected on these events through the construction of new philosophical concepts. Words like “the event” and “equality” became prominent in a new philosophical vocabulary. Various thinkers, including Jacques Rancière, directed their attention towards the supernumerary part of every situation, and emphasized that struggles over equality are central to questions of politics. With the reelection of the general de Gaulle in 1968 and the arrival of the troops of the Warsaw pact in Czechoslovakia, the hopes for a new social order awakened by both movements were progressively foreclosed. Some of these hopes were resurrected during Czechoslovakia’s “Velvet Revolution” of 1989, as many participants began to call again for a true workers’ democracy and a renewed socialism. But the rapid privatization of state assets and the liberalization of the market during the 1990s transformed the philosophical significance of 1989 into a primarily negative process, a marking point that was claimed to signal the termination of the historical sequence known as “communism.” 1989 became a date symbolizing, for some, the culmination fixed historical processes and the end of history; for others, who recalled the hopes that had been foreclosed, it symbolized a strange, incomprehensible catastrophe. At the current moment, when the absence of emancipatory politics has opened a space for resurrected forms of xenophobia and nationalism, we see it as vital to rethink the meaning of 1989 in light of 1968. What affirmative aspects of those two events have been forgotten? What was the historical sequence that led to the shattering of the Second World? Ultimately, what did those events bring to the philosophical thinking of their time? What new concepts and new philosophical vocabularies were initiated by those events? And how did the visions of France’s Mai 1968 differ from similar ideas that emerged during the Prague Spring? 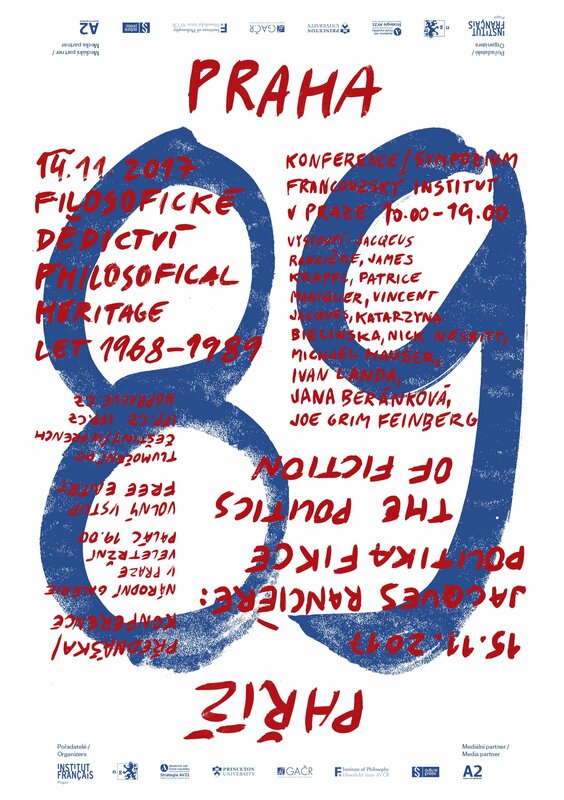 The goal of the conference: “1968-1989: PARIS – PRAGUE” is to think history along with philosophy, to think philosophy in its historicity, and to think through the emergence of philosophical concepts and truths in historical events. The conference will unite leading historians and cultural scholars working on these dates as well as philosophers investigating the philosophical meaning of historical events. The conference will take place on the occasion of French philosopher Jacques Rancière’s first public presentation in Prague. Rancière will deliver a public lecture at the National Gallery in Prague, in addition to a keynote lecture at the conference itself. 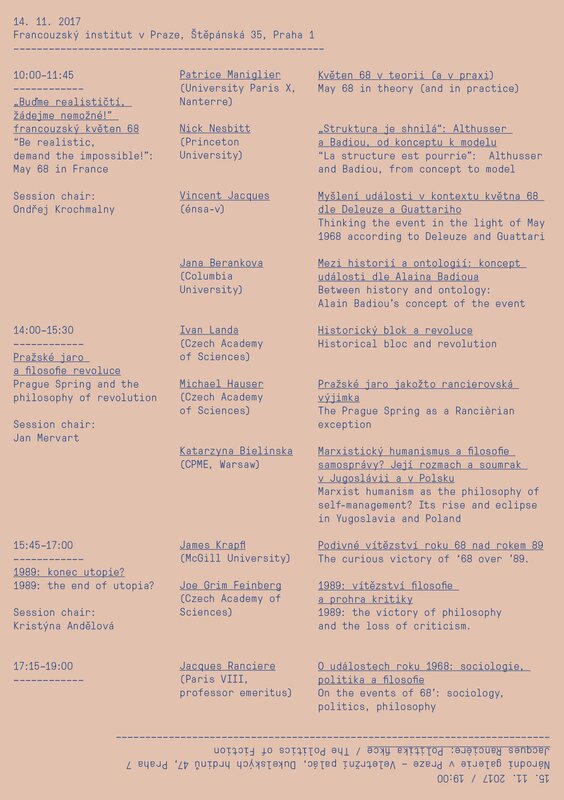 The conference will unite scholars working on the legacy of Central and Eastern European critical Marxist thought, together with scholars focusing on the heritage of 1968 in continental philosophy.